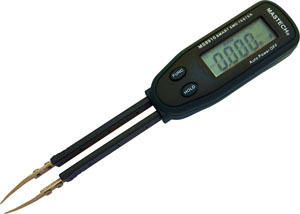 The Tester measures SMD components (Resistance & Capacitance) with high accuracy. Digital readout with large numbers. Handy and inexpensive tool helping in electronics production, quality control, service and prototyping. Precise tips are made of non-magnetic steel and are able to pick up and reliably contact even smallest SMD components, or take measurements from the devices already mounted on a board. The Tweezers can also be used to test conventional components. Practical one hand measurement allowing use of other hand to hold object containing SMD devices. Continuity Check. When Resistance is less than 30 Ohm, the Buzzer will sound.